Hannah Simpson Grant and Jesse Root Grant, parents of President U. S. Grant. 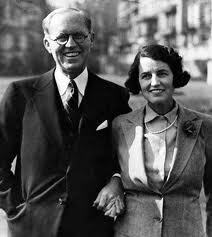 Ambassador Joseph Kennedy and Rose Fitzgerald Kennedy, parents of JFK. President George H. W. Bush and Barbara Pierce Bush, parents of the 43rd president. Three Presidents had a living father and mother when they took office. Only three Presidents had both a living father and mother when they took office Grant, Kennedy and George W. Bush. Only two had both parents present at the inauguration, Kennedy and Bush. Ulysses Simpson Grant was inaugurated on March 4, 1869; his father, Jesse Root Grant, who attended the ceremony, died on June 29, 1873; his mother, Hannah Simpson Grant, who did not attend, died on May 11, 1883. John Fitzgerald Kennedy was inaugurated on January 20, 1961; his father, Joseph Patrick Kennedy, and his mother, Rose Fitzgerald Kennedy, both attended the ceremony. President Kennedy was assassinated on November 23, 1963; his father died on November 18, 1969; his mother died on January 22, 1995. George Walker Bush was inaugurated on January 20, 2001; his father George Herbert Walker Bush, and his mother, Barbara Pierce Bush, both attend the ceremony. John Quincy Adams was inaugurated on March 4, 1825; his father John Adams, died on July 4, 1826. Millard Fillmore took office on July 10, 1850; his father, Nathaniel Fillmore, did on May 28, 1863. Warren Gamaliel Harding was inaugurated on March 4, 1921; his father, George Tryon Harding, died on November 19, 1928. Calvin Coolidge took office on August 3, 1923; his father, John Calvin Coolidge, did on March 18, 1926. George Washington was inaugurated on April 30, 1789; his mother, Mary Ball Washington, died on August 25, 1789. John Adams was inaugurated on March 4, 1797; his mother, Susanna Boylston Adams, died on April 17, 1797. James Madison was inaugurated on March 4, 1809; his mother, Nelly Rose Conway Madison, died on February 11, 1829. James Knox Polk was inaugurated on March 4, 1845; his mother Jane Knox Polk, died on January 11, 1852. James Abram Garfield was inaugurated on March 4, 1881; his mother, Eliza Ballou Garfield, died on January 21, 1888. William McKinley was inaugurated on March 4, 1897; his mother, Nancy Allison McKinley, died on December 12, 1897. Franklin Delano Roosevelt was inaugurated on March 4, 1933; his mother, Sara Delano Roosevelt, died on September 7, 1941. Harry S. Truman took office on April 12, 1945; his mother, Martha Ellen Young Truman, died on July 26, 1947. Jimmy Carter was inaugurated on January 20, 1977; his mother Lillian Gordy Carter, died on October 30, 1983. George Herbert Walker Bush was inaugurated on January 20, 1989; his mother Dorothy Walker Bush, died on November 19, 1992. William Jefferson Clinton was inaugurated on January 20, 1993; his mother, Virginia Kelley, died on January 6, 1994.